All kids go through a fussy stage when it comes to food. Three and four-year-olds will suddenly become fearful of vegetables. And teenagers will develop a taste for junk food that horrifies you. If your family meals feel like an endless battle to keep everyone happy, then you may be in need of some clever ways to cope. After all, you have your own meal preferences too! Figuring out what the problem is can help you plan around it. If there is a particular vegetable that isn’t popular, you may be able to swap it for something of equal nutritional value. Sometimes eating habits can become a more serious problem. Programs like Adolescent Growth can help you identify when food has become a big issue for your child. If you think something might be wrong, don’t wait for them to ‘grow out of it.’ Some children also avoid food they may be sensitive to. If they complain it gives them a tummy ache, it could be worth following up with the doctor. Of course, kids have a favorite meal. Why not make sure it features in your weekly meal plan? Let your kids pick a day when their meal is chosen. Make sure you get your own one on there too! When everyone can see what they can expect for their family meal, they may be more willing to accept it. You can print it out and stick it to the fridge. It can be fun to cut out pictures of the fruits and vegetables on offer for the younger kids to add to the planner too. Best of all, it helps you budget and prepare the meals more quickly and easily. If your children repeatedly leave their veg on the plate, you may be worrying that they’re not getting all the nutrition they need. Preschoolers may need to try a vegetable up to ten times before they will accept the flavor and texture. It’s important to persevere, though. Strong-willed teenagers will often just refuse to eat something they don’t like the taste of. When you’re preparing sauces, consider using a blender to puree the vegetables they’re avoiding. Hiding the veg can work quite well. Some kids get bored at the dinner table. They want to rush back to the TV or their phone. Some will even try to bring their devices to the meal! If you feel this is part of the problem at mealtimes, then why not set some rules. You can write them down together and pop them up on the wall as a reminder. 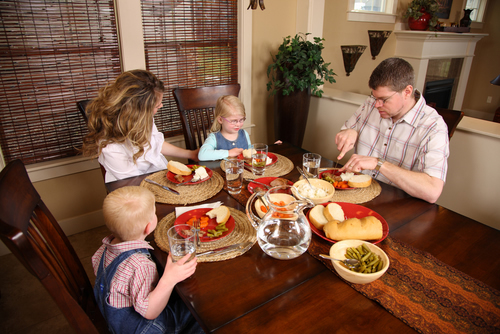 Ask your kids to get involved and help develop your own family table etiquette. You might commit to a thirty minute period of time starting at 6pm for example. One bite of each thing on the plate may be another rule, especially for preschoolers. 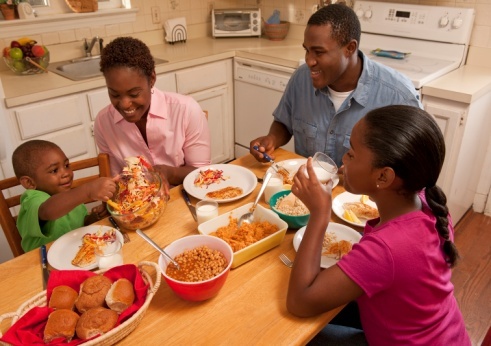 Mealtimes can be the source of indigestion for many parents. But it’s important to persevere and make the most of this time together.